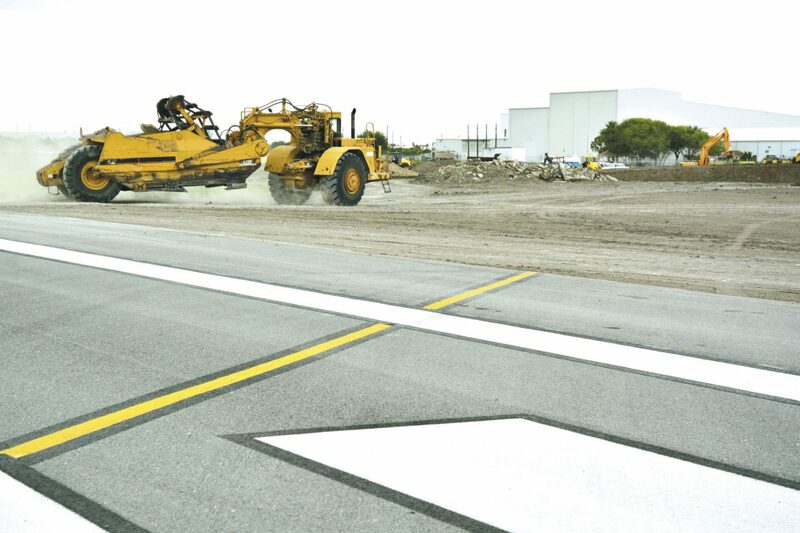 The south end of Valley International Airport's longest runway at 8,301 feet, 17R/35L, is undergoing modification to reduce the turn angle for pilot's entering from the taxiway. The yellow lead line shows the route pilots used to take to transit from taxiway to main runway. The modification will in effect add 500 usable feet for takeoffs and landings. HARLINGEN — A runway adjustment which will add 500 feet to Valley International Airport’s longest runway should be finished by mid to late October, airport officials say. At 8,301 feet, runway 17R/35L is the longest of the three runways at Valley International Airport. But a tricky entrance to the south end of the runway from the taxiway was too tight a turn for pilots, especially in bigger jets. A 500-foot section of the runway was basically unusable because of the hard left turn. This week, contractors were hard at work on creating a new, easier turn for pilots easing their way onto the runway. “As you can see now, this is where they did come in, at that angle,” said Bryan Wren, assistant director of aviation at VIA, as he waved toward construction crews while rolling down the closed runway in an airport pickup. “But they could not make this turn coming from that way. So we ripped all that out, and that’s already been backfilled. Cost of the project initially was about $2.8 million, with $2 million coming from the Federal Aviation Administration and $800,000 from the facility charge which is added to each airline ticket sold. But Wren says after some changes to the project, it’s going to come in $100,000 under budget. “We’re ahead of schedule and actually we’re under budget,” he said. Wren said the improvements to the runway will enhance passenger safety and make operations at the airport more efficient.